The following data is from a study by the National Floor Safety Institute (NFSI) on the causes of slip and fall injuries. Research, based in part on insurance industry claims data, has revealed five major causes responsible for almost all slips, trips and falls. Although the actual percentages may vary from one industry to another, the following five causes have been well documented across different industry groups, environmental conditions, and geographies. Although the walking surface is most likely to be identified as the primary cause of a slip, trip, and fall accident, comprising 55% of all falls, the remaining 45% are attributable to four other factors, including footwear, fraud, hazard identification, and training. Therefore, a property owner’s or manager’s slip and fall prevention strategy should focus on a comprehensive approach that addresses all causes especially their floors. 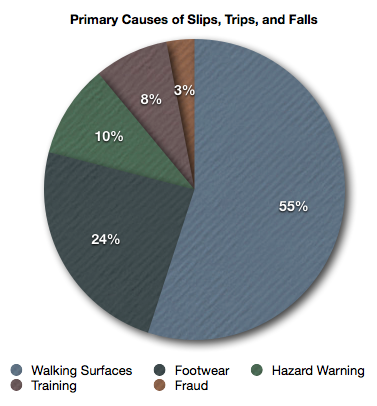 Although these numbers indicate that footwear choice contributes to a moderate portion of slip and fall injuries, it’s important to recognize that this does not necessarily vitiate liability from property owners. There are some cases where proprietors have been made aware, or should have been made aware of hazards that become more dangerous when people are walking around with certain types of shoes. For example, a high profile 5-star restaurant should reasonably expect women to sometimes wear heels to their establishment, and therefore, reasonably protect against any impairments or obstacles that could lead to harm.